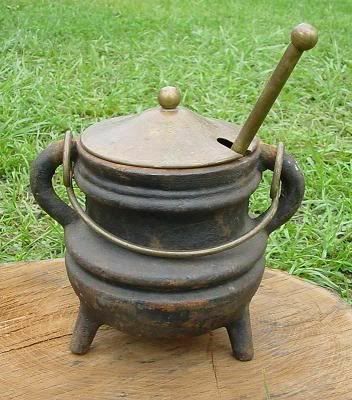 What is this pot used for? I grew up with something similar to that in the house. The one we had was a bit smaller and for the life of me, I don't remember what its specific use was for. Maybe for making gun powder I wonder if we still have that thing. Mom had it sitting on the fireplace hearth.....hmmmm.....I need to sleep on this one and seek knowledge from my elders ....ok...it's all coming back to me now....there was a reason it sat on the fireplace hearth.............You put oil in the pot, stick the soft rock in the oil to soke up the oil, light it and stick it in a pile of wood chips to start a fire. 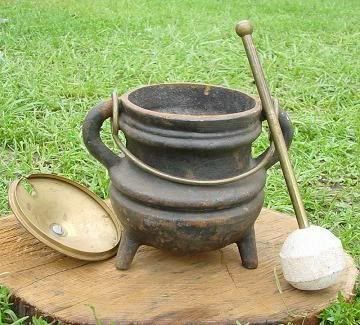 zelph wrote: What is this pot used for? there was a reason it sat on the fireplace hearth.............You put oil in the pot, stick the soft rock in the oil to soke up the oil, light it and stick it in a pile of wood chips to start a fire. so this oversized kitchen match on steroids....how do you put it out once the fire's lit? DarenN wrote: so this oversized kitchen match on steroids....how do you put it out once the fire's lit?